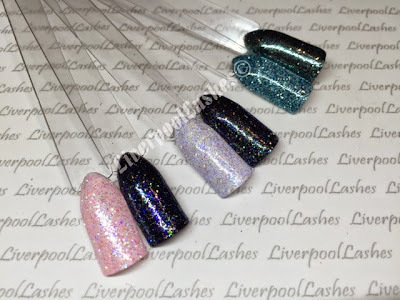 So today is the day that I can finally talk about the six new colours that have been released for the spring summer with Lecente along with the New World collection of five brand new stardust glitters that I will talk about in a few days time. I was delighted to be asked to create their introduction videos for this new collection so therefore I have had these for over a week now, I've had to keep my mouth shut and not show you which is been so difficult because they are all stunning! Click here to watch the video!! 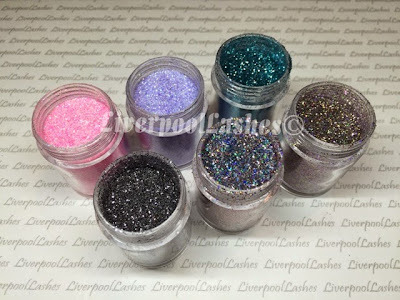 There are two iridescent glitters, two ultra fine glitters and two multi glitz glitters. 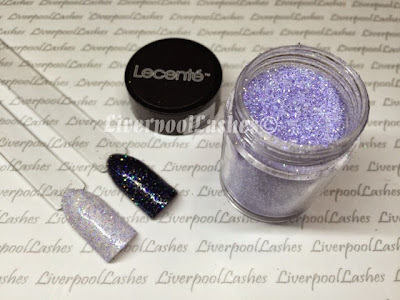 The iridescent line is their translucent glitter that changes depending on the colour underneath. 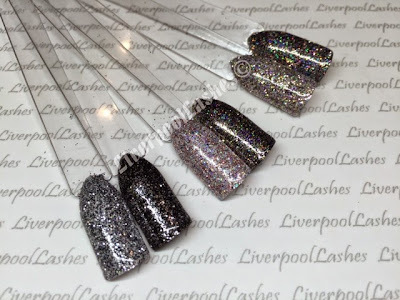 The ultra fine range is their precision cut glitter for the perfect sparkle and the multi glitz collection has a rainbow of different glitters for the ultimate sparkle. 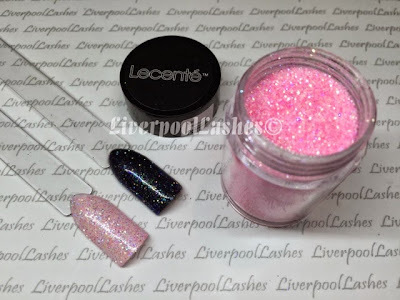 The first glitter is from the iridescent range and it's called 'Baby Pink.' Just as the name suggests this is a baby pink shade, if you do want to achieve this then you would pair it with a similar shade underneath. 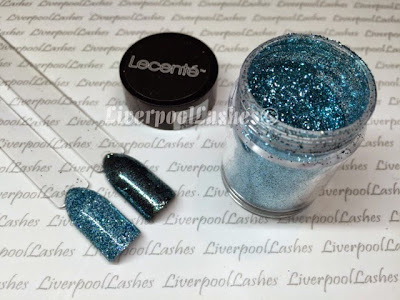 The special thing about this glitter and the next one that I'm going to show you is that it completely transforms when it's over a dark shade which you can see in the above and below photo. The next glitter is the order iridescent glitter and it's called baby blue. I must admit I do think that this has got quite a lot of a lilac tone to it but once again just like baby pink It would look good with a matching shade lighter shade but then look completely different with the darker shades. Now onto the two ultra fine glitters. The first one is called Tiffany and just as you would imagine this is the perfect Tiffany blue shade. 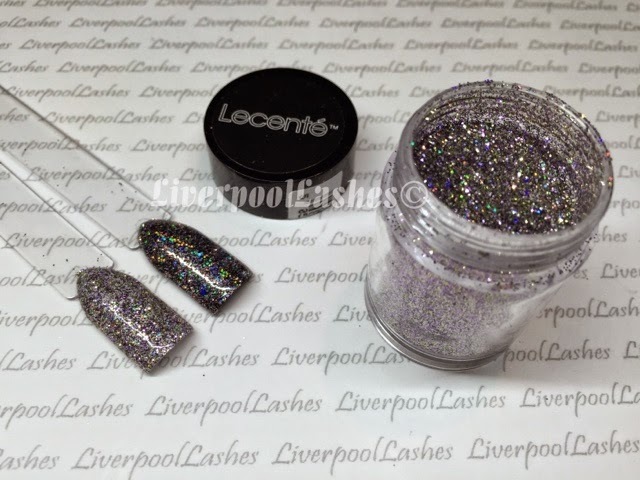 The sparkle of this one is simply stunning you can see on the video that I produced for Lecente, it really is a stunning shade. 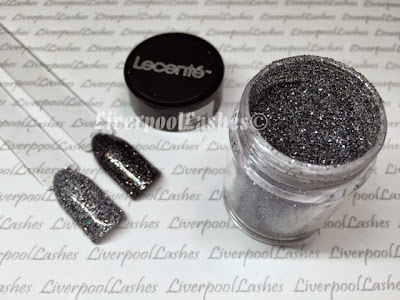 The other ultra fine glitter and is called Pewter and again this is a grey shade. This sort of colour always makes me feel like it would be good for our party or a special event. Of course to me, this is an every day appropriate shade - as are the rest of them! 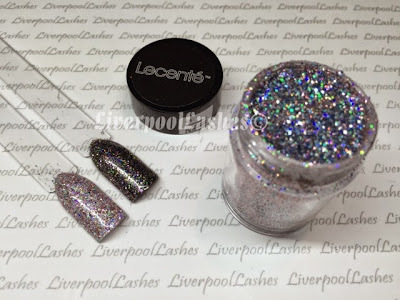 Next up are the two multi glitz glitters. The first one is Goddess which has mainly greens and blues but definitely also has red in it. The truth is it's really hard to pinpoint a particular shade as there truly are so many in it but believe me, when you see it your eyes will dance! The final new glitter is called Sugar Lips which I must admit, does make me giggle a little and I'm not entirely sure why. Again because this glitter has so many colours in it it's hard to pick out the keys ones bit it does have an undertone of purple in it I think! The photos below are the swatches I've mentioned in order both over white and black for you to see. 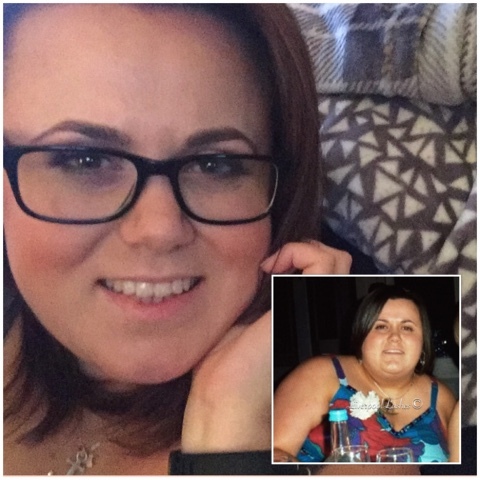 I do hope you've found this post useful. 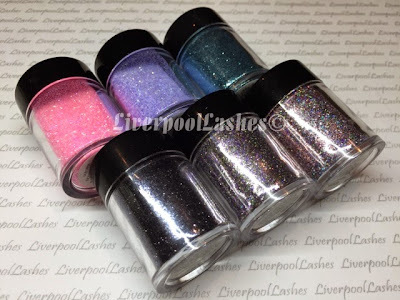 Don't forget to follow my Facebook page to keep up to date with everything I'm doing and New World Stardust Collection video should be up soon on the Lecente You Tube channel for you to see. All glitters will be lauched at Excel next Sunday!